A few photos of train workings in 2002 around the Geraldton area. I have included this photo to show that it is worth photographing even the everyday scene on the railway. 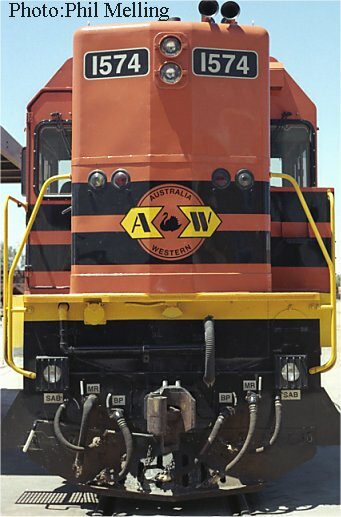 We photographed DA1574 at Bunbury, Merredin and Geraldton with its AWR logos. Yet less than a month later from when this photo was taken 1574 now carries ARG logos. It is interesting to also contrast the end paint schemes on this photo and 1572 below which carries the yellow Westrail livery. 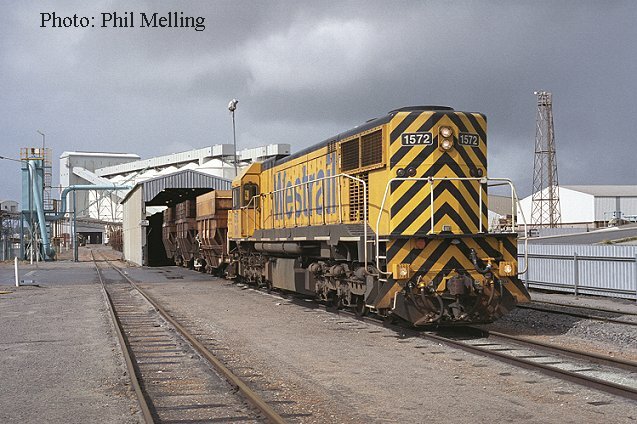 DA1572 unloads a Talc train at the Geraldton Port at lunchtime on 15 August 2002. The Talc train normally unloads at the Port during the night and only on rare occasions is it seen during the day. 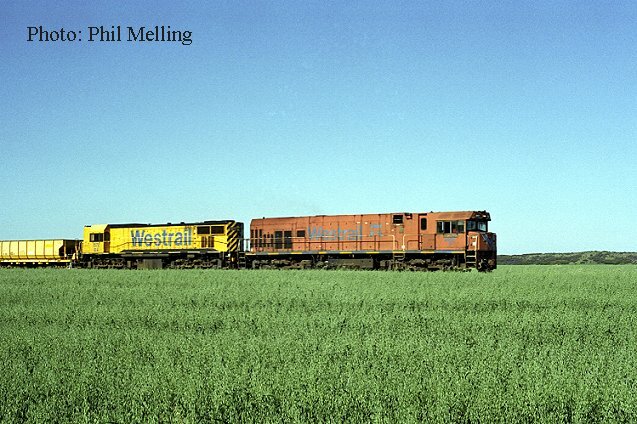 P2007/DA1572 haul a combined ballast & coal train through the green crops on the Greenough "Flats" on 8 September 2002 heading to Narngulu. 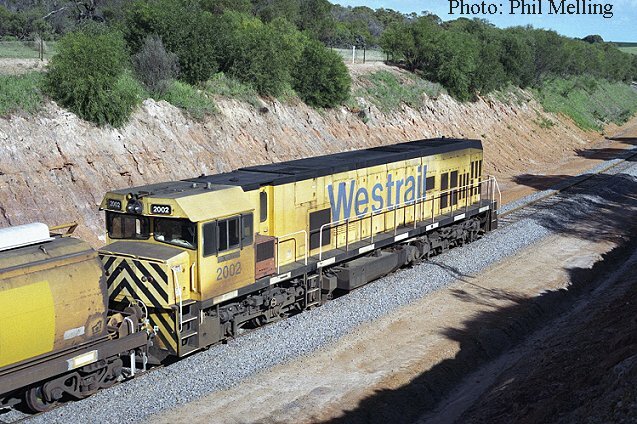 P2002 heads downgrade through the Bringo cuttings on 10 August 2002 with a loaded grain train for Geraldton. P2007/ P2012 & dead attached P2015 haul a 74 wagon loaded coal & empty grain train into Narngulu from Perth on 14 July 2002. 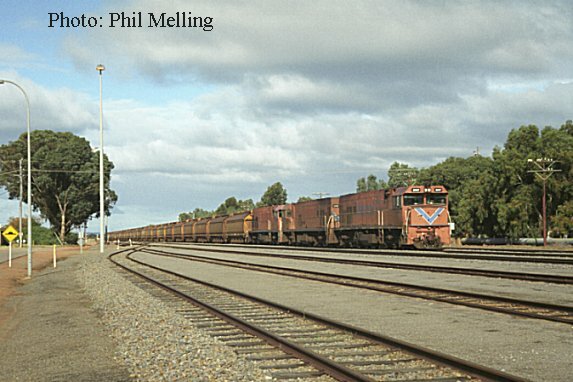 Two days later P2001/P2002&P2015 arrived on a 75 wagon consist, the reason was to transfer extra grain sets to Narngulu to handle an increased shipping program for grain exports from the Geraldton Port.